This book brings together the most current thinking about the Anthropocene in the field of Environmental Political Theory ('EPT'). It displays the distinctive contribution EPT makes to the task of thinking through what 'the environment' means in this time of pervasive human influence over natural systems. Across its chapters the book helps develop the idea of 'socionatural relations'—an idea that frames the environment in the Anthropocene in terms of the interconnected relationship between human beings and their surroundings. Coming from both well-established and newer voices in the field, the chapters in the book show the diversity of points of view theorists take toward the Anthropocene idea, and socionatural relations more generally. However, all the chapters exemplify a characteristic of work in EPT: the self-conscious effort to provide normative interpretations that are responsive to scientific accounts. The Introduction explains the complicated interaction between science and EPT, showing how it positions EPT to consider the Anthropocene. And the Afterword, by a pioneer in the field, relates all the chapters to a perspective that has been deeply influential in EPT. This book will be of interest to scholars already engaged in EPT. But it will also serve as an introduction to the field for students of Political Theory, Philosophy, Environmental Studies, and related disciplines, who will learn about the EPT approach from the Introduction, and then see it applied to the pressing question of the Anthropocene in the ensuing chapters. 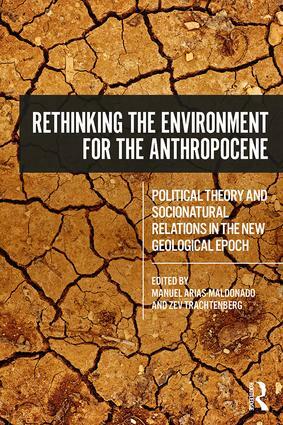 The book will also help readers interested in the Anthropocene from any disciplinary perspective develop a critical understanding of its political meanings. Geo-engineering: a curse or a blessing?